Hang hangers, curtains, or Wrap GorillaPod onto these Hangrods. 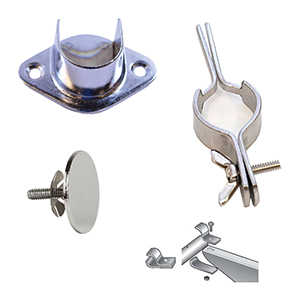 We have Hangrod Accessories compatible with any wall system. Our Mount Wall Brackets can be screwed into bare walls. Snap on Brackets to extend your Heavy Duty Slatwall or Gridwall Brackets to hold our Hangrods. Attach Clamps for Flange Brackets found in our Slotted Wall Standards. We have varying sizes from 4 – 12 feet long Hangrods. Use our Hangrod Splicer to connect multiple Hangrods as one unit. For Slatwall and Gridwall, use their brackets to hold Hangrods. We have just about any Hangrod Accessories for any Wall System at American Retail Supply and if you order in-stock items before 4pm PST, you can get same day shipping. Call to find out which items are ready for you, 1-800-426-5708.